The DC-based Woodrow Wilson Center, established by Congress, has sold out to corporate America and political interests. Its president, former Congressman Lee H. Hamilton, has questionable corporate links. •	Violating its Congressional mandate by ignoring vital aspects of President Wilson’s record. •	Accepting large contributions from unsavory corporations. •	Giving an award to the undeserving Ahmet Davutoglu, Turkey’s Foreign Minister. The WWC is a think tank-like institution created by The Woodrow Wilson Memorial Act of 1968. Congress stipulated that the WWC must commemorate Wilson’s “ideals and concerns” and memorialize “his accomplishments.” One-third of its funding comes from taxpayers. Its president since 1999 is former Indiana Congressman Lee H. Hamilton. In reality, Woodrow Wilson’s “ideals and concerns,” “accomplishments,” and “advocacy of international understanding” are of little concern to the WWC. Instead, its agenda is driven mainly by money and politics. •	Lee Hamilton’s (and the WWC’s) questionable corporate ties, particularly with BAE Systems, the main sponsor of his forthcoming gala dinner. •	Denunciations of the WWC and Hamilton that the initial exposé brought about. •	Research into Wilson’s WW I era record and policies that the WWC has suspiciously rebuffed. Back in May, I was unaware that WWC President Lee Hamilton is a board member of one of the Center’s top corporate donors, BAE Systems Inc. That’s the American division of the largest weapons and defense firm in the world, BAE Systems plc, based in the U.K., with annual sales exceeding $36 billion. Lee Hamilton’s 34 years as Congressman (D-IN) and his service on the CIA External Advisory Board, FBI Director’s Advisory Board, 9/11 Commission, and elsewhere are cited in his biography on the WWC website. Nowhere, however, does the WWC mention his simultaneous service to corporate America. Hamilton -- whose WWC salary exceeds $410,000 and who qualifies for a hefty Congressional pension -- is a member of the boards of not only BAE Systems Inc. (since 2004), but also Carbon Motors (since 2008), and the Albright Stonebridge Group (since 2006). The latter is a DC-based “global strategy firm” headed by former Secretary of State Madeleine Albright (co-chaired the so-called “Genocide Prevention Task Force" with former Defense Secretary William Cohen, whose firm represents Turkish businesses; they both refuse to acknowledge the Armenian genocide) and National Security Advisor Sandy Berger (pled guilty to stealing classified documents needed by the 9/11 Commission). Even aside from Hamilton’s corporate connections, can the WWC serve as a “neutral forum” for, and objectively analyze, the issues facing the American people when companies with mercenary agendas – overseas business interests, deals with sordid foreign governments, genocide denial, Federal contracts, and more – are helping to foot WWC’s budget? BAE, for example, has lobbied against an Armenian genocide resolution in the U.S. Congress and, like several WWC donors, is a member of the American Turkish Council. The ATC is a business group that has shamelessly labored to defeat the Armenian resolution and that FBI whistle-blower Sibel Edmonds has accused of serious wrongdoing. No one believes that BAE, and the fifty or more other corporations that have forked over thousands to join the WWC’s WilsonAlliances program, have no influence on the WWC’s agenda and activities. It turns out that three days before my initial report on the WWC was published, the 79 year-old Hamilton informed his staff that he will be retiring as president. Not surprisingly, the WWC’s harem of mega-corporations are throwing him a going-away party. BAE Systems has shelled out $250,000 to be the evening’s sole “Presenting Sponsor.” Did we mention that in the last three years BAE has also donated a minimum of $100,000 to the WWC’s parent, the famed Smithsonian Institution? The Smithsonian (the site of the WWC Gala) has even more unsavory corporate donors and relationships than the WWC. But we’ll save that for another time. $250,000 surely also buys a lot of gratitude from attending dignitaries and WWC’s salaried staff, bureaucrats, and alleged scholars. BAE is allowed to put a “branded give-away” in the evening’s “guest goodie bag.” The guests may include President Obama and the First Lady, the event’s “Honorary Chairs.” Obama and Hamilton are good friends. Hamilton even held a private dinner at the WWC with the president-elect and their staffs several days before the inauguration. It may be unwise for the President to chair an event in which BAE is the main sponsor. Around the same time, BAE agreed to pay a fine of 30 million BP (about $50 million) to the U.K.
What had the genocide-denying BAE done wrong? Among other things, BAE had bribed Saudi officials, reportedly using slush funds, to buy jet fighters. The BBC says that the bribes were in the hundreds of millions of dollars. There were numerous other allegations of dishonest or unlawful practices by BAE in deals with Romania, South Africa, and Tanzania. To avoid scrutiny, BAE had made illicit payments through intermediaries and front companies. The DOJ also charged BAE with making “false applications for export licenses” for sensitive U.S. technology in Gripen fighter jets that the company leased to the Czech Republic and Hungary. We should note that the DOJ says that the American division of BAE was not involved in the criminal conduct to which BAE pled guilty. One suspects, however, that the decision not to prosecute the BAE’s U.S. division may have been partly a political one. It is telling that Britain’s own investigation into BAE had been “unlawfully” halted for political reasons, until the British High Court of Justice ruled that the investigation must continue. Using U.S. banking records, Chilean authorities charged that BAE had secretly funneled more than $1 million to ex-dictator Augusto Pinochet through offshore accounts. The payments, apparently to bribe Pinochet into concluding arms deals with BAE, continued up through 2004, two years before Pinochet’s death. Boeing and Chevron have also paid $50,000 each to be “National Sponsors” of the WWC Gala. Both companies have lobbied, obviously at Turkey’s urging, against the Armenian genocide resolution. Executives of both companies have also received WWC’s “Corporate Citizenship Award.” Coincidentally, Chevron recently acquired a lease to explore for oil in Turkish waters. It obviously pays to play ball with Turkey. The earlier exposé noted that the WWC has accepted cash contributions from several other corporations that have individually, or as part of an organization, opposed the Armenian resolution. For example, Alcoa, Bechtel, Bombardier, Coca Cola, Exxon-Mobil, Honeywell, and Lockheed-Martin are members of the American Turkish Council or the Aerospace Industries Association, both of which have lobbied against the genocide resolution. Given WWC’s corporate love affair with Turkey, it’s no wonder that in June the WWC traveled to Istanbul to give awards to Turkish Foreign Minister Davutoglu (detailed in the first exposé) and a multi-billionaire Turkish businessman. The latter’s Dogus Holding conglomerate is, not surprisingly, a member of WWC’s WilsonAlliances. The award to Davutoglu was especially undeserved because it is well-known that he and Turkey have gratuitously complicated U.S., European, and U.N. policy in the region. Wilson’s famous Fourteen Points -- for which he received the Nobel Peace Prize in 1920 -- sought “autonomous development” for all peoples under the Ottoman Turkish yoke, especially the Armenians, for whom he had a particular empathy. 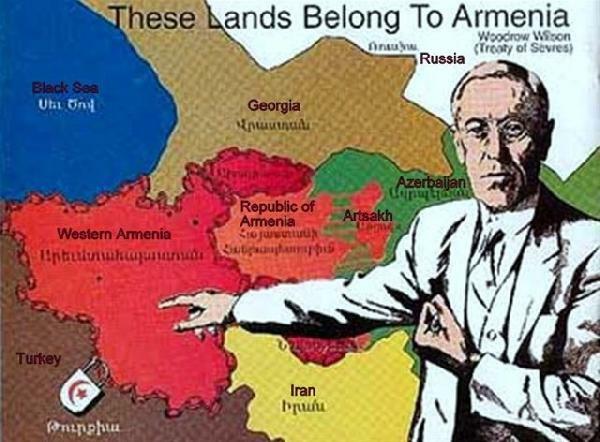 After WW I, the Paris Peace Conference tapped Wilson to arbitrate the borders of Armenia on former Ottoman territory. Wilson’s decision became part of the Treaty of Sevres (1920). Despite its contemporary relevance to Turkey and Armenian-Turkish relations, this body of knowledge has been all but ignored -- no doubt for political and monetary reasons -- by the WWC and its Wilson Quarterly journal. By virtually ignoring these vital aspects of Wilson’s “ideals, concerns, and accomplishments,” the WWC has violated The Woodrow Wilson Memorial Act. •	In two articles (“Pawn for the Wrong President,” and “Presidential Legacy for Sale”), Wilson family descendant and human rights advocate Donald Wilson Bush blasted the WWC. •	The Armenian National Committee of America said that the award to Davutoglu “makes a mockery of President Wilson's belief in free and open inquiry.” Davutoglu “has devoted his own personal energies and the resources of his Ministry to silencing discourse within Turkey and the United States on the Armenian Genocide, one of the most prominent human rights issues that Woodrow Wilson himself actively pursued,” and “President Wilson was a tireless champion of Armenian rights and security.” The award to Davutoglu “makes a mockery of the Wilson Center and its founding commitment to fostering scholarship commemorating ‘the ideals and concerns of Woodrow Wilson.’"
I have recently learned of another instance of the Center’s willful blindness to President Wilson’s accomplishments and ideals. Two years ago, the former Armenian Ambassador to Canada, Ara Papian, applied for one of WWC’s Fellowships. An expert in history and law, Papian is fluent in English, Armenian, Russian, and Persian. He also served in Romania and Iran, and graduated from the NATO Defense College. Papian proposed to do “thorough and comprehensive research” into America and President Wilson’s involvement with Turkey and Armenia, particularly official American reports of that era and Wilson’s Arbitral Award to Armenia in 1920. Papian would explore “key materials located in U.S. national and academic collections in the greater Washington, DC” area. The WWC turned Ambassador Papian down flat without explanation. Clearly the rejection wasn’t due to any flaws in Papian’s proposal, which aligned perfectly with the aims of an American institution supposedly dedicated to Wilson’s ideals and record. Then again, how would it look for the WWC, financed by companies committed to covering up the most barbaric aspects of Turkey’s history, to accept Papian’s proposal? •	Wilson Center personnel, and those affiliated with it, particularly scholars, must speak out publicly against pandering to corporations and lobbying organizations. •	Those whose business or personal interests may conflict with their WWC role should resign. •	The WWC must reject all tainted corporate cash. •	The WWC should create a principled program on genocide. Recognized genocide scholars should be invited to speak at the Wilson Center and publish in the Wilson Quarterly. •	The WWC must establish a meaningful, ongoing dialogue with those persons and their descendants who have been victimized by Turkey’s genocides. •	The WWC must return to its Congressional mandate by truly rededicating itself to Wilson’s “ideals, concerns, and accomplishments” and by advocating against genocide and for the human rights and dignity of all people. It is the job of the Congress, the Attorney General, the President, and the American people to ensure that these reforms materialize. The author is an Armenian American freelance journalist. Many of his articles are archived at Armeniapedia.org.